How do I return to the main site from Meta? The redesigned all-new top bar has a Help dropdown menu. There's a Meta item in there. 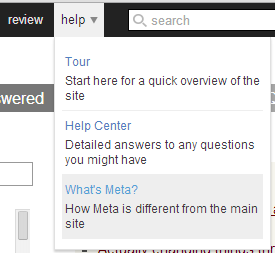 That's a great thing, because now you can access Meta easily. How do I return to the main site from Meta (without typing the URL manually)? I can visit my profile and click main user, but that's not something you would do intuitively. Am I missing something? If not, then I think appropriate item should be added to the Help menu (so you can return from Meta the same way you got there). Click Stack Exchange, then Super User. Use your web browser's built-in features. Not the answer you're looking for? Browse other questions tagged feature-request user-interface . 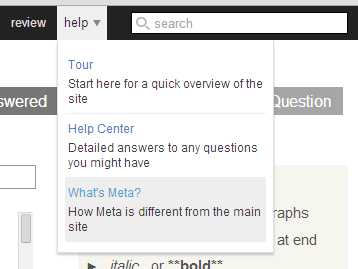 Should the upvote/downvote tooltips on meta.su be harmonised with meta FAQ? What is the proper way to cite an answer from another StackExchange site?